The 1891 census above shows George and Emily with their children still living at 48 Lorrimer Road. The details on the census are poorly written. The family now comprised of George (aged 46) his wife Emily (39) and their children George (16), Emily (15), Alice (13), Lilly (11), Daisy (10), Gracie (9, Herbert (8), Adelaide (5) and Roy (3). Its interesting to note that George Musgrove's occupation is shown as Cab Driver and Groom. This is the only document which George as working rather than being of independant means. This is possibly due to the Court case which was still pending concerning his trust fund payments. Note also he shows his place of birth as Yorkshire which is a mystery as all early records show he was born in St Pancras. The maps below show the immediate area around Lorrimore Road. 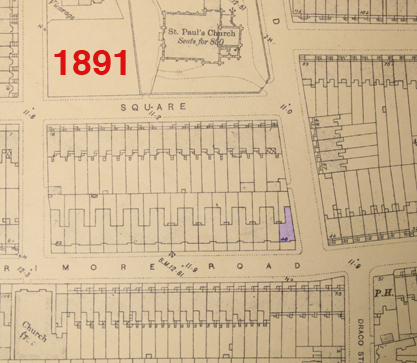 Number 48 is coloured purple on the 1891 map (left). 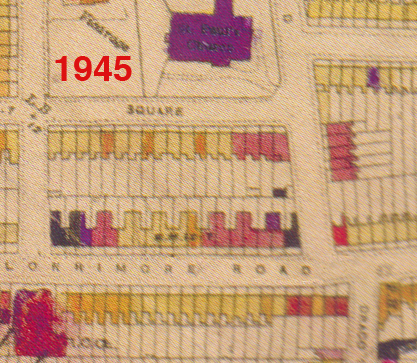 The bomb damage map from 1945 (right) shows light damge to the immediate area apart from St Paul's Church which was destroyed.